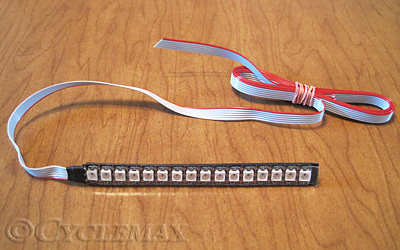 Note: To use these Flexible Multicolor LED strips, you also need at least 1 Rollin' Eyes LED controller (not included). You can use, program and configure the controller with your iPhone OR Android smartphone or tablet. Each controller can drive up to 288 LED's. The strips are full waterproof and have a self adhesive backing. Power consumption : 0,28 watt per led. Example : 48 of our ultra bright LED's when at full power white will use 1 AMP at 13,5 volt. Route the cables from each strip to the controller and connect it with one of the included connectors.